Volunteer Sue Thomasen assists Dave Scott in the surgical suite. Photo by Michele Miller Houck. 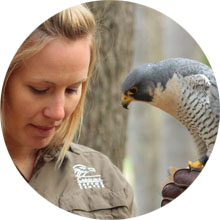 Few raptor centers in the country handle as many patients as CRC. This high patient load provides an enormous amount of data for future research. It also provides a great environment for learning. High school and college students, adult volunteers and interns, veterinary students, rehabilitators and educators - they all come to CRC to take advantage of the hands-on opportunities we can provide. For several years, CRC has hosted groups of veterinary students from NCSU-College of Veterinary Medicine for a one week veterinary "selective," allowing students to immerse themselves in raptor rehabilitation and medicine at CRC’s rehabilitation center. 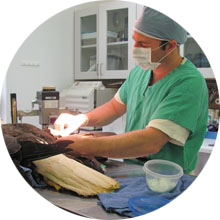 Veterinary students can take part in our two-week RaptorVet externship. RaptorVet is an intensive, hands-on experience that touches on all aspects of raptor medicine from the initial intake exam to the eventual release. Students will work side-by-side with the CRC staff and case work is supplemented with daily labs and lectures. 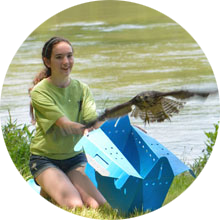 Learn more about our RaptorVet Externships. Our professional development programs will directly impact a small segment of the population: veterinarians and veterinary students; but the large-scale, indirect impacts of this program are enormous. Veterinarians serve as the bridge between people and animals and are relied upon for their knowledge and expertise in the care of all animals, including wildlife. As human-wildlife interactions continue to grow in number due to increased human populations and decreased land and habitat available to wildlife, it is increasingly important for veterinarians to be skilled in the health and medical care of wildlife. Because the study of raptor medicine can reveal the presence of bio-contaminants such as mercury and pesticides, which can have negative consequences for human health, knowledge of avian health will assist veterinarians with effective public education. 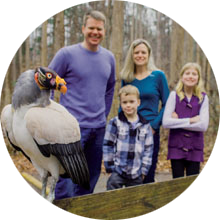 Furthermore, as zoonotic diseases such as avian flu and West Nile virus continue to spread and have an impact on the human population, it is crucial that veterinarians have a solid foundation in avian medicine so that they are effectively able to understand these diseases and accurately communicate the potential threats and viable solutions to the general public.